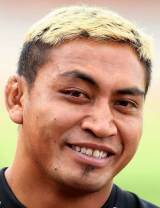 Former All Blacks flanker Jerry Collins was born in Apia, Samoa. Collins, a bruising blindside and sometime No.8, made his international debut against Argentina in Christchurch in 2001. He had to wait two years for his next cap but was duly included in the New Zealand squad for their failed run at the 2003 Rugby World Cup in Australia. Collins played all three Tests against the British & Irish Lions in 2005 before helping the All Blacks to the Tri-Nations title and a Grand Slam tour. He played his final Test in the All Blacks' infamous quarter-final exit from the 2007 Rugby World Cup at the hands of France. That year Collins famously turned out for Barnstaple's Second XV while on holiday in Devon and wore the club's socks while playing for the Barbarians. Collins played his provincial rugby in New Zealand for Wellington and graduated in to the Hurricanes setup in Super Rugby. Following his international retirement Collins agreed a deal with French Top 14 side Toulon and subsequently joined Magners League side Ospreys in 2009, winning the inaugural Magners League Grand Final. His playing career would then take him to the Yamaha club in Japan in 2011.